CA Attorney General Releases Recommendations for Medical Identity Theft Prevention | South Carolina Personal Injury Attorneys | Criminal Defense Lawyers - Strom Law Firm, L.L.C. The report was spurred by a recent survey that found 1.8 million Americans are currently affected by medical identity theft. There have also been several concerns that the online health care exchanges set up through the Affordable Care Act could make medical identity theft worse. According to the Ponemon survey, medical identity theft includes doctors writing fraudulent prescriptions, and individuals receiving health care using another person’s information. Attorney General Harris’s recommendations to health care poviders begins with these groups demanding strong background checks for staff members that have access to medical records and identifications. Health care providers also need to be able to quickly cut off a terminated employee’s access to agency databases and networks. Harris also recommends that health care providers use a “red flag” system at patient registration for billing and records management, and to make it easier for staff to recognize potential medical identity theft. This should be an automated process, according to Harris. Organizations also need a clear response plan to investigate a red flagged medical record. If organizations are pro-active, they can help avoid fraud and medical identity theft by following up on complaints and informing patients regarding steps to correct medical identity theft. Health care organizations and insurance companies also need to keep up with current trends in medical identity theft to more quickly spot potential problems, and keep patients informed of potential problems as well. Patients should be notified when a medical identity theft investigation has been opened on their account by a previously-agreed upon method, such as email, text, letter, or phone call. Harris also recommended that policy makers address the issue of electronic flagging capabilities, certification requirements for systems, audit requirements, notification and dissemination requirements, and data sharing agreements. “The U. S. Department of Health and Human Services should include a medical identity theft incident response plan as a certification requirement or as one of the best practices they are currently developing for health information organizations or exchanges and Accountable Care Organizations (ACOs),” her report suggests. Medical identity theft occurs when someone obtains a person’s name and some other part of their identity—such as insurance information—without the consent of the person resulting in false claims being filed for medical goods or services, or to obtain medical goods or services. If you have experienced identity theft, including medical identity theft, you are not alone. 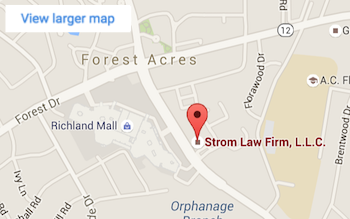 The Strom Law Firm offers free, confidential consultations to discuss the facts of your case. Do not hesitate to contact us. 803.252.4800.